Previously-unknown BGVP made headlines recently with their DMG IEM, a product that offers a lot of value for the money and that I found to be especially compelling. 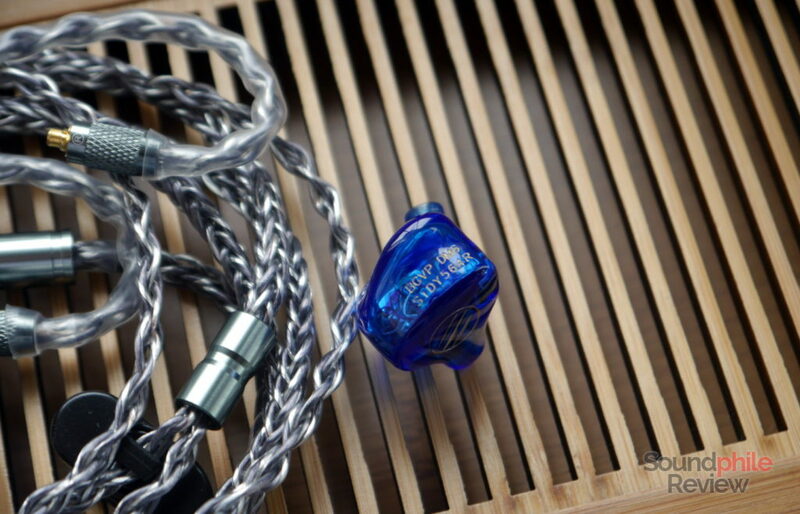 There was therefore much anticipation for the BGVP DM6, an IEM that uses five balanced armatures per channel, and those high expectations are met with a high-quality product that deserves much praise. Disclaimer: Lillian at Linsoul Audio kindly sent this sample to me. I won’t have to send it back. They sell the DM6 on Amazon and AliExpress at ~$199. BGVP does not differentiate their products too much using packaging – in fact it is identical for all of their products I tried so far. 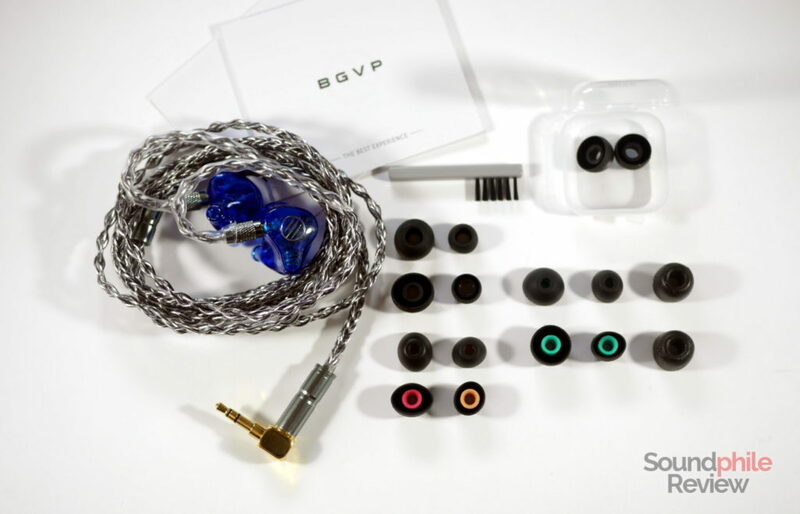 So the BGVP DM6 come in a cardboard box that holds the earpieces, the cable, a small brush to clean the earphones and several pairs of eartips (one foam, three soft black silicone, three silicone with harder inner bore). There is pretty much everything one needs, except for two things: a clip to secure the cable against dresses and a carrying case. While the BGVP DMG is certainly unique in its design, the BGVP DM6 takes a more traditional approach, at least when it comes to shape. Its base shape is triangular, but a few protrusions make it mimic the shape of the inner pinna to provide better comfort. In this sense, the BGVP DM6 is similar to many other products on the market – see examples such as the TENHZ P4 Pro or the Toneking T88K. The BGVP DM6 comes in many different colours and can even be customised; in my case it is transparent blue. 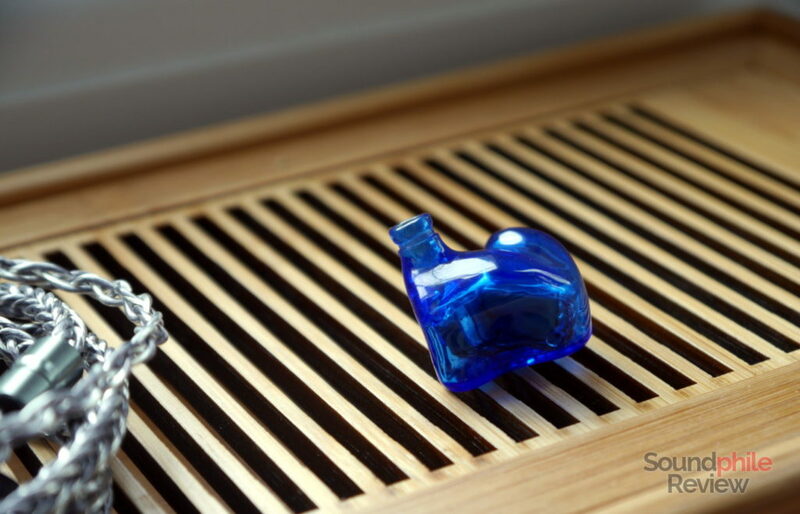 The shell is entirely made of plastic and appears to be made by a single piece – the drivers are fused with the plastic and float in it, and there’s no way to open the shell. While this may make the earphones more resistant, this can as well prove a bit problematic if one needs to fix something – problematic as in “fixing is not possible”. All in all build quality appears rather high, however, and I can’t find any specific flaw. I can only gripe about the choice of MMCX connectors, which tend to be not as durable as the 2-pin alternative, but it is an industry standard with it own pros – plus, the connector is solidly attached to the body. The plastic used seems rather good and durable, though it may not stand being run over with a tank. The BGVP DM6 is rather comfortable, from a strictly subjective standpoint. I can go on using them for hours upon hours, and even found myself using them for almost six hours during a flight and the consequent transfers to and from the airports. It needs some adjustments over time to stay comfortable, though, as the peculiar, almost anatomical shape is not finely tuned for my ears and causes some slight discomfort in a few areas. This is countered by moving the earpiece a bit so that it does not push against the same spot all the time. Overall it is a very comfortable experience, one that I can rate among the best I’ve had so far with universal IEMs. As I had this flight while using the BGVP DM6 (or vice-versa, if you wish), I was also able to test their ability to isolate the listener and I have to say that it is really good. Although I left the volume to a relatively low level, I was never bothered by neither the engines’ hum nor by the usual noise one has to live with during a flight – announcements, people talking, children crying and so on. In fact the flight was calm and quiet and I thoroughly enjoyed my music. I also used the earphones as improvised earplugs: while waiting for boarding on the airport runway, an aeroplane passed nearby with its engines at full blast (which was incredibly noisy) and the DM6 effectively reduced the noise to tolerable levels! The cable is thick and even a bit stiff, with eight cores that then split into two groups of four cores each. They’re individually sleeved in grey plastic that takes two tones, one darker and one lighter. The general effect, also thanks to the weaving, is that the cable looks a bit like a chain. 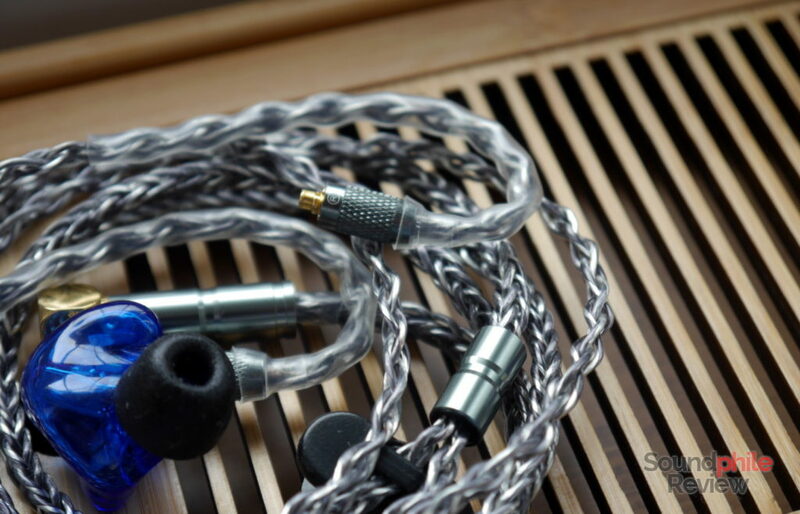 It is one of the best stock cables I’ve seen to date: solid, robust and (seemingly) durable, with high-quality connectors and resistant sleeving. Speaking of the connectors, the jack is angled (90°) and the whole thing is made of metal, with a premium glossy finish (but no strain relief other than the metal cylinder); the MMCX connectors, on the other hand, have a milled metal cylinder which is then covered by preformed soft plastic that give the cable the typical around-the-ear shape. There is plenty of microphonics, despite the cable being around the ears. In fact, even using a shirt clip can’t completely eliminate microphonics. Thankfully the cable is replaceable, so using an alternative cable (e.g. Yinyoo 8-core SPC cable or Kinboofi 8-core SPC cable) can alleviate or even eliminate the issue. I tested the BGVP DM6 using a Topping DX7, a Topping D30 that fed a Venture Electronics RunAbout 2.0bl, a Venture Electronics Odyssey and a Cayin N5ii. An iFi IEMatch was also used. No break-in was applied. Source files were mostly FLACs in standard resolution. I tested the BGVP DM6 using stock foam tips as they are the best in terms of comfort to me. The “6” in “DM6” should stand for the number of balanced armatures in each earpiece… but it does not. In fact there are 5 balanced armatures inside each earpiece, so I do wonder where the “6” came from. BGVP crammed a lot of drivers in a relatively small space and at an affordable price, whereas products with as many drivers as the BGVP DM6 are usually pricier. What’s more, BGVP used renowned Knowles drivers in conjunction with their own drivers, achieving results that are frankly amazing. High sensitivity and low impedance mean the BGVP DM6 is incredibly sensitive to the source’s output impedance and to background noise. In fact, the DM6 revealed some sibilance in Cayin N5ii’s output, something that came as a surprise to me as the player had always been dead silent with other headphones I had tried. Although the BGVP DM6 have a large soundstage, they are never able to produce a soundstage large enough to defeat the “in your head” sensation most IEMs create. Despite this, they are often able to make sounds appear like they come from far, both laterally and frontally, so we may say they achieve a great level of quality in this field. Imaging is also very good and beyond what I would expect from a sub-$200 IEM, as it is precise almost to the point of letting the listener be able to pinpoint the exact location of the source instrument. What really got me by surprise, though, was instrument separation. While many designs that employ multiple balanced armatures tend to display higher-than-average ability at separating instruments, that is not always true and should not be used as rule of thumb. But that’s exactly the case with the BGVP DM6, as it is able to make one separate all the different instruments with great ease throughout the whole spectrum and even with difficult and congested tracks – see Tarova or Grown Folks by Snarky Puppy. The acoustic picture, so to speak, is always very clear and never makes one wish for additional separation. I would describe the BGVP DM6’s signature as balanced and almost neutral, though it has a bit of a deviation from that neutrality target in mid-bass, which is very slightly elevated. It is a solid sound signature that makes the DM6 a great all-rounder. Bass is impressively flat, though it lacks a bit of oomph in the lowest end. It reaches 40 Hz with full power, but then roll-off is rapid enough and 20 Hz is barely audible, with everything in-between that is progressively less intelligible. All in all, though, it is an impressive lower section just by considering its extension and flatness. There is a small bump between 150 Hz and 200 Hz, but it is really soft and bass as a whole appears almost flat. This is quite an achievement, considering the use of balanced armatures and the price point the DM6 are sold at. There’s enough power to feel lower notes, even in demanding tracks such as the evergreen Angel by Massive Attack or in Power of Denial from the American Beauty soundtrack. Speed is remarkable and notes are always clear and clean, without showing any flabbiness; on the other hand, though, this speed never translates to the feeling of impact that dynamic drivers give (see e.g. Venture Electronics Zen 2.0 Omega Edition). However, the level of detail reached is remarkable and allows one to easily hear small nuances and different instruments playing in the same area of the spectrum. Not less impressive is midrange. Again we find lots of details and remarkable speed, which combine together to create a lively and energetic midrange section with remarkable balance. No part is predominant and everything sounds clear and detailed, no matter what you throw at it: voices (both male and female), guitars, pianos, violins… they all sound great. A special mention, however, goes to brass instruments, that sound especially vivid and lifelike (and I write “lifelike” just because I lack a better term for that, but it is a term I generally despise when used in this context). The aforementioned speed makes drums and plucked instruments pop out, but it also renders them in great detail and allows for a lot of subtleties to show off – as a practical example, the leather of drums bouncing in The Battle from the Master and Commander soundtrack (another evergreen in my reviews). Treble offers a large amount of micro-details that make it really interesting – you can hear all the different shades and nuances in the drummer’s movements of sticks and brushes on snares and cymbals, as an example. There is great refinement in this area, and the great extension helps bringing highs to life. In fact extension is really good, although the (inevitable?) roll-off is still present and audible, albeit slow. It’s not sparkling and vivid, yet it is crisp. TENHZ P4 Pro: the TENHZ P4 Pro sound much more artificial and congested than the DM6. They lack bass, both in terms of quantity and in terms of depth, though what’s there is decently fast. Midrange is almost distant-sounding and it lacks body and detail. Treble has good presence and detail, yet extension is not as good. The sound as a whole is dull and compressed, with much less perceived detail – it lacks breathing space, so to speak. Soundstage is really small compared to the DM6, and imaging is nowhere near as good; what’s most noticeable, though, is that instrument separation is way inferior. Despite a small difference in price, the P4 Pro are not in the same ballpark as the DM6. BGVP DMG: BGVP’s cheaper (yet very capable) hybrids have a somewhat different tuning. There is a bit more bass, but it is less “dry” than on the DM6 and it has more of the impact I wrote about above; it is also not as fast and detailed, despite sounding more engaging and fun. Midrange is a bit warmer, with a similar level of detail and slightly less speed. Treble is where there is most difference, though, as it is more prominent and even more detailed. In terms of technical ability, the soundstage is slightly larger on the DM6, while imaging is similarly precise. Instrument separation appears to be better on the DM6. All in all the difference between the two is not night-and-day; the DMG are a bit more fun and offer what I see as slightly better treble, but they are less neutral and less detailed in the rest of the spectrum. Shozy x Neo CP: Shozy’s latest collaboration effort, this time with CP (after the Shozy Hibiki Mk2 made with AAW), delivers convincing sound. The tuning is similar to the DM6’s: bass is good both in quantity and extensions with good speed, being almost as good as the DM6; midrange has similar tuning to the DM6 but less detail and slightly less speed; treble, on the other hand, is slightly more in the background and it has less extension. Imaging is on par with the DM6, while soundstage is smaller and instrument separation is inferior. It’s still really good and a valid alternative to the DM6, especially if you like treble to be a bit more laid back. 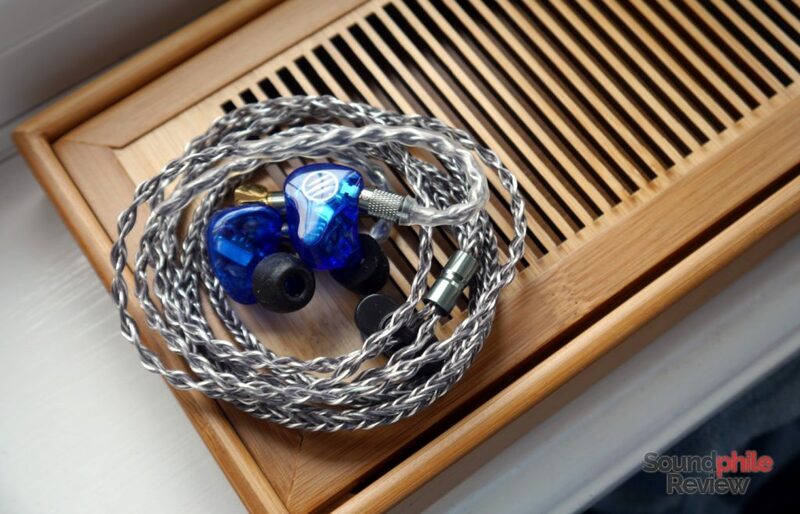 KZ AS10: although completely different in terms of pricing, both IEMs share the basic design that employs 5 balanced armatures. Similarities end here, however. The AS10 sounds almost as a toy in comparison to the DM6, with much less detail and precision across the whole spectrum. It is midrange that comes out as the weakest element in the comparison, as it is not as engaging because of its slightly warm tint. Mid-bass is more, yet bass as a whole is not as present as on the DM6; it is also not as detailed and not as fast. Treble is more present, yet less detailed and extended. Soundstage is narrower, imaging is not as accurate and instrument separation is inferior. 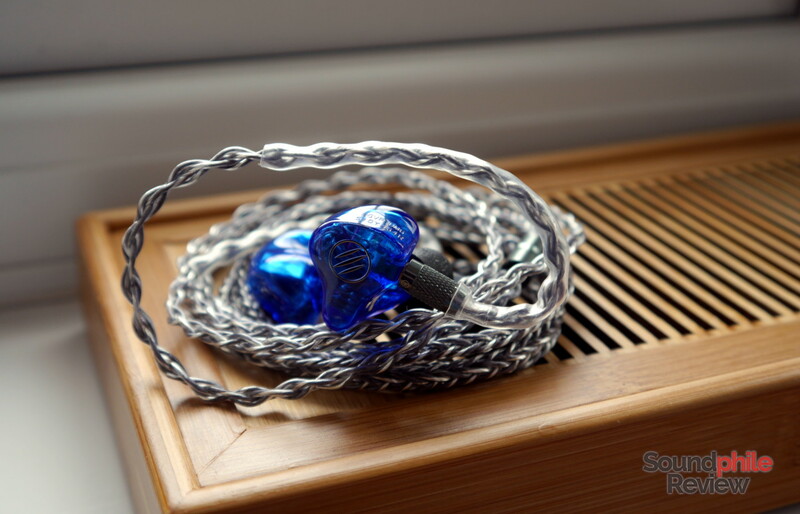 Yet the AS10 are still very good, considering they are 1/3 the price and the first fully-balanced-armature IEM by KZ! When I reviewed the BGVP DMG I was impressed by that IEM and I was curious to try the DM6, which someone told me was even better. I can now confirm that. The BGVP DM6 are extremely solid on any front – build, materials, sound, technicalities. The BGVP DM6 has, in short, everything I think one should look for in headphones. They are so good I think their price is even low for what they offer – at $199, they are really great and they can probably compete with IEMs in the $300-400 range. This is not an IEM that had to grow on me, it was love at first listening. I really recommend getting a pair of DM6 if neutral, finely crafted sound delivered in a well-made, comfortable envelope is what you are looking for. I promise you won’t regret it. The BGVP DM6 won’t make you think you never listened to music like this before, or give you the “wow” factor, but they will surely give you many hours of pleasure. Can you give a more detailed comparison between the DM6 and the DMG? Mainly how much better is the DM6 and how much am i losing if I were to get the cheaper DMG? I think he described it very well: if you want a V-shaped fun tuning, get the dmg, if you want a leaner sound with a more neutral tuning, get the dm6. I would be more of a dm6 guy. Can these be compared to some TOTL IEMs like the Campfire Audio Andromeda? Nice review. I have a pair on order which are currently on their way to me in the UK. Really looking forward to hearing these after the few reviews I’ve read and glad I waited as I almost got the DMG (not that they are bad or anything). Any advice on a balanced 2.5mm cable to go with these. I’m using a Fiio X5iii and Hiby R3 when out and about. I do have a good balanced cable but could probably do with another one to save on cable changes etc. I don’t like swapping cables about too often and although I rate the one I have it was pretty expensive and there are a lot out there to try. Great and very useful review! How do they compare to Tin Audio T2? i live in Italy. 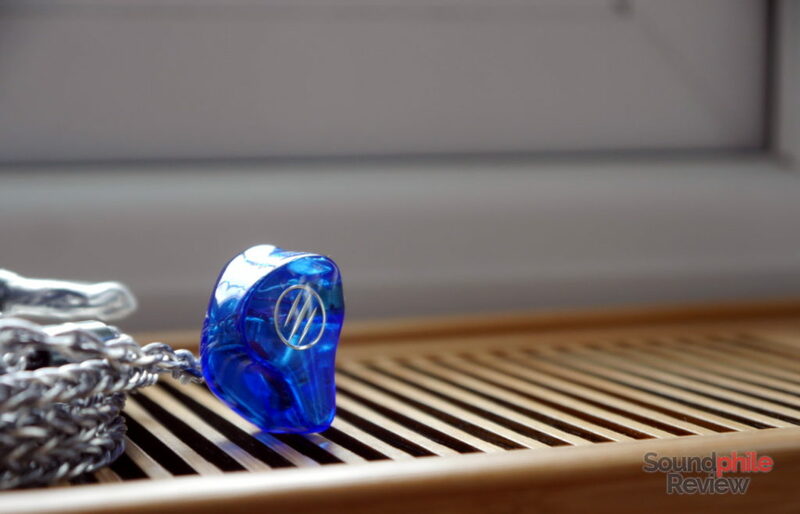 where can i buy this pair of iem? You can find a couple links to stores where you can buy them after the introduction. They ship to Italy, too. I have the KZ AS10 as my first BA IEM. I was blown away by the detail compared to my much much more expensive headphones. I heard about the DM6 and couldn’t fathom more detail. I have them on order and can’t wait. Thank you for your comparison, it makes the anticipation that much more agonizing. Very useful review.. I clearly understand that I’m one of DMG people.. Thanks..
How would you compare this to the FiiO FA7? I don’t have that IEM, sorry.